Cast: Ryan Philippe, Jesse Bradford, Adam Beach, Jamie Bell, Paul Walker, Robert Patrick. Directed by Clint Eastwood, written by Paul Haggis, William Broyles Jr, James Bradley and Ron Powers. Story: The story behind the soldiers who raised the flag at Iwo Jima. Running Time: 2hrs 12 minutes. Flags of our Fathers is a war movie, much like many others before it and, depressingly, many yet to come. Yawn. Why moviemakers continue to be obsessed with recreating the horrors that the human virus inflicts on itself, I'll never know. Why people pay to watch it is an even greater mystery to me. Clint Eastwood's Flags of our Fathers is just as painful to watch as any other semi-realistic war movie and if, like me, you don't like being depressed by movies, go and see Happy Feet instead. 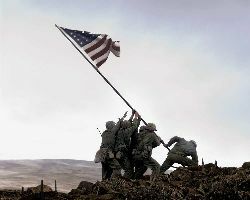 Flags fills in the back story behind the soldiers famously depicted in the iconic flag-raising photo, taken at the battle of Iwo Jima in the second world war. Flown home in order to raise money so the killing can continue, their new fame is interspersed with flashbacks of the carnage that led to that photo. As we've become accustomed to expect, the war scenes are pretty grisly and not at all easy to watch. So don't take the kids. It's very hard for me to be objective about this. If you're into these realistic depictions of war, you'll love Flags, even though it's aimed at a more transatlantic audience. The performances are all solid and apart from it being very difficult to tell the actors apart on the battlefield, there's nothing I can put my finger on to criticise. Paul Haggis, a busy man at the moment with a hand in Casino Royale and The Last Kiss, contributes to the screenplay, but his influence is not as obvious here as with the others. There are moments of poignance, such as when a soldier falls overboard on the way to the island and is left to drown, but aside from that, I can see nothing here to recommend over the countless other equally unpleasant war movies that have infected our viewing lives. Flags of our Fathers is just another war movie. If you like that, good for you, you'll like this as much as you liked the others, because there's nothing really wrong with it. I, however, wish they'd stop making them. Clint's making a sequel early next year, told from the Japanese perspective - I only hope there's something new in that one. Testosterone Satisfaction Rating: 2/5 - adults only, just because of all the realistic maiming. It's not pleasant. To enjoy this film you should: like war films. Flags of our Fathers was released in the UK on 22nd December.